AHMADINEJAD CHAVEZ AND MUGABE TO SPEAK AT CLIMATE CHANGE FARCE IN COPENHAGEN…… – The Tundra Tabloids……. Moody: Finally the world is speaking our language Robert! 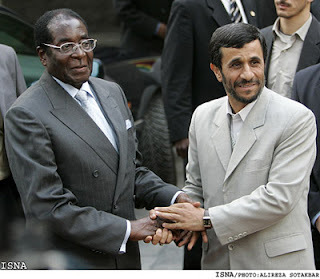 COPENHAGEN –Iranian Prime Minister Mahmoud Ahmadinejad, Venezuelan President Hugo Chavez and Zimbabwean President Robert Mugabe plan to address negotiators at international climate talks in Copenhagen next week. The assistant president of Sudan, Nafie Ali Nafie kicks off the speeches at noon on Wednesday. Nafie chairs the G-77 group, a block of developing nations pushing hard for more money and stricter emissions cuts from rich countries. Mostapha Zaher, director-general of Afghanistan’s Environmental Protection Agency, is listed as the final speaker. He’ll take the podium slightly before 2 a.m. next Friday. Other leaders addressing the conference include everyone from Saad Hariri, the prime minister of Lebanon, to French President Nicolas Sarkozy. Roughly 110 world leaders plan to attend the talks, an unprecedented number for a climate conference. Typically, only a handful of top leaders attend the negotiations. President Barack Obama is expected at the meeting on Friday. Previous Post Previous Post TO THE TUNDRA TABLOIDS JEWISH READERS: A VERY HAPPY HANUKKAH……!